Fremont, CA (April 14th, 2010) - ASUS, the leading provider of high performance motherboards, launches the highly anticipated Republic of Gamers (ROG) Rampage III Extreme and Maximus III Extreme motherboards in North America today. Featuring class leading designs and innovative features, the ROG Rampage III Extreme and Maximus III Extreme set a new standard for world class enthusiast motherboards. Rigorously tested and approved by leading enthusiasts, the Extreme series is engineered from the ground up for exceptional performance, stability, overclocking prowess, and most of all, reliability under extreme conditions. Computer enthusiasts and gamers alike have been clamoring for new and improved board designs along with expanded feature sets. How did ASUS meet these requests by offering the best balance between gaming and overclocking capabilities in an enthusiast level product? It is simple; ASUS personnel across the company listened to, discussed with, and then implemented ideas from a variety of users in the gaming, enthusiast, and extreme overclocking communities. The world record breaking overclocking abilities of each board is attributable to superb hardware and BIOS designs that came about as the ROG team worked closely with key overclockers worldwide to ensure exceptional performance under extreme cooling along with comprehensive feedback on BIOS tuning. While the new ROG Extreme series offers cutting edge overclocking capabilities it also provides an extremely stable and fast platform for gaming. It is this special balance between performance and stability that makes the new Rampage III Extreme and Maximus III Extreme boards so unique. Solid and efficient power management is something every overclocker and enthusiast knows is critical in board design. ASUS’ new Extreme Engine Digi+, included on the Intel X58 based Rampage III Extreme and Intel P55 equipped Maximus III Extreme, allows new levels of control and performance by combining the best in digital and analog PWM designs. New features help differentiate the ROG Extreme series from other motherboards when it comes to overclocking. These features include new LN2 mode and Q-Reset options that minimize cold boot problems during extreme overclocking along with dual 8-pin ATX power connectors and dual 4-pin Molex plugs to ensure proper is available to the CPU and Video cards respectively. In addition, the boards offer the ability to disable or enable the individual PCI Express x16 lanes so users can optimize the location of their video cards if custom cooling solutions are utilized or for debugging various setups. ASUS implemented a new USB based BIOS flashing system that does not require a CPU, Memory or Video Card to update the BIOS. All the user needs is a working power supply to quickly update either onboard BIOS chip. The new ROG Connect software offers class leading overclocking and monitoring tools that can be controlled with a smart phone or a separate computer via quick connect technology to ensure the best possible overclocking experience. The Rampage III Extreme and Maximus III Extreme also incorporate the latest in I/O technologies with full support for true SATA 6G and USB 3 to ensure the highest levels of performance for internal and external storage devices. The Rampage III Extreme introduces a class leading Intel based Gigabit network controller to ensure the user’s online experience is exceptional whether they are playing the latest game or viewing HD media content. 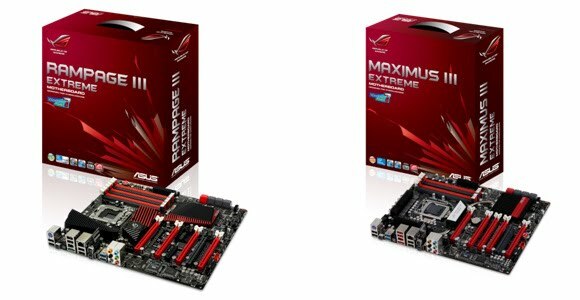 The Rampage III Extreme and Maximus III Extreme are available now at authorized ASUS retailers for an MSRP of $399 and $349 respectively. For more information on the new Extreme Series, please log on to http://rog.asus.com . ASUS is a leading company in the new digital era, with an extensive product portfolio that includes notebooks, netbooks, motherboards, graphics cards, displays, optical drives, desktop PCs, servers, wireless solutions, mobile phones and networking devices. Driven by innovation and committed to quality, ASUS designs and manufactures products that perfectly meet the needs of today's digital home, office and person. ASUS won 3,268 awards in 2009, and is widely credited with revolutionizing the PC industry with the Eee PC™. With a global staff of more than ten thousand and a world-class R&D design team, the company's revenue for 2008 was 8.1 billion U.S. dollars. ASUS ranks among BusinessWeek's InfoTech 100, and has been on the listing for 12 consecutive years.